Design personalised cushions with your photos or bespoke designs. These high quality double sided photo cushions are ultra soft and luxurious. Easy to design online, even as a collage cushion, you can choose to design both sides or design one and choose from five backing colours for the reverse. Photo cushions are available in two square sizes and one rectangle size. Every personalised cushion comes with a plump, luxurious pad in your choice of poly-fibre or duck feather, making the highest quality photo print cushion in rich and vibrant colours. Sit back and relax with custom printed photo cushions surrounding you on the sofa or in bed. The Soft Velvet fabric is a dream to snuggle against and the plump, sumptuous padding makes them the ultimate cuddle companion. Available in three sizes, you can design each one in the range for a stunning personalised cushions gift set. Upload your photos on both sides or choose a gorgeous pastel colour for the reverse. 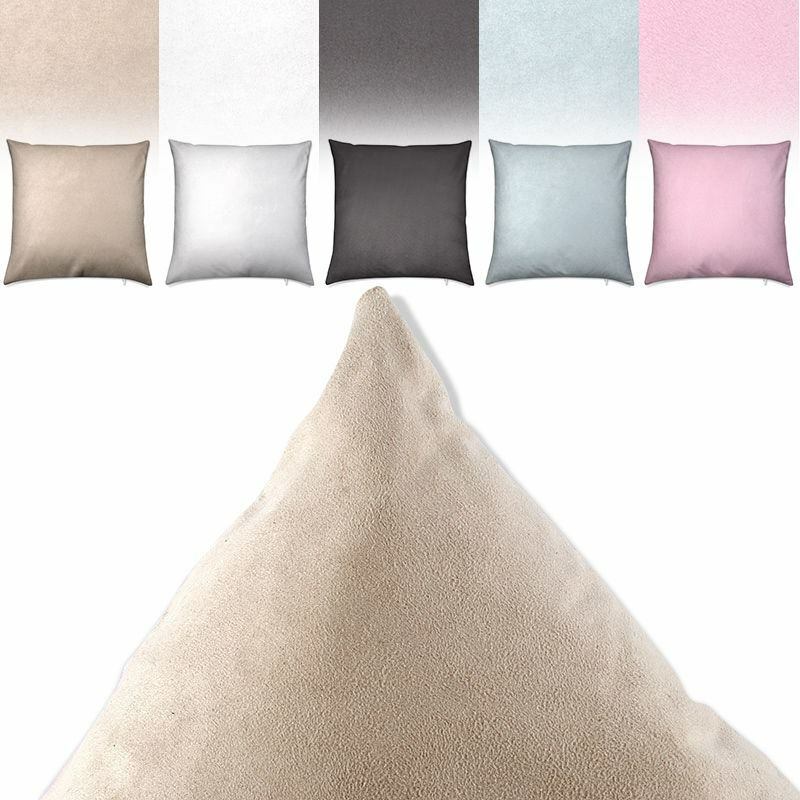 You can choose from cream, soft pink, baby blue, grey, and white, to ensure your personalised velvet cushion goes perfectly with your decor. Either way, it's a stunning, handmade home furnishing that oozes style and sentimentality. Every sumptuous cushion is made in our facility so we can watch over the quality every step of the way, which, we believe, shows in the finished article. The wonderful soft velvet fabric is printed with your bespoke designs and photos. When you stroke this cushion, you will be amazed at just how velvety soft it is - even softer than a baby's bottom, and that is saying something! Our artisan crafters hand cut to size and hand sew the case to shape. Next your choice of classic or heart pendant zipped closure is added. Not only are your unique photo cushions lush on the outside, they equally match on the inside too. We fill your luxury cushion covers with soft and plump pads full of your choice of real duck feathers or, ideal for those with a feather allergies, a gorgeous poly-fabric version, which does not compromise in the slightest on quality, comfort, or style. For Your Safety: Toy and cushion filling fibre BS5852 compliant. Have you ever missed your pooch or moggy so much at night time that you wish you could see their little face? Well, pet photo cushions are a more hygienic alternative to letting your furry friend in bed with you. Print their purr-fect face onto this soft velvet cushion and scatter across your bed for a dreamy night's sleep. Do you and your partner have cute nicknames for each other? Print them onto these velvet cushions for a totally unique gift. Whether it's fun and flirty like 'Baby Spoon' and 'Big Spoon' or it's a little more romantic and lovey-dovey, what's important is that they represents your unique love for each other. Whether you're a massive Wolfhounds fan or partial to a bit of hurling, have you ever thought of printing the whole team or even just your idol's face onto these customised photo cushions? You won't have to spend all day stalking them on social media as their face can be present by your side at all times. Whether it's Christmas, or birthdays, or anything in between, personalised photo cushions make for a great gift. Add your picture, and even add text to make a unique celebration cushion which will be a treasured keepsake for years to come. Floor Cushions. Big soft lounge around cushions with your photos or design on them. Superb print and finishing on the detachable cover.